User Guide - How to Apply for TSTET 2019 Notification: 5th Teacher Eligibility Test (TET) 2019 i.e., the First Telangana State Teacher Eligibility Test(TSTET) Notification has been released by the DSE Telangana in the month of March 2019 and it will be conducted in all 10 Districts of the state on May 1st. TS Teacher Eligibility Test for Recruitment as a teacher for classes I to VIII in the TS Govt Schools. 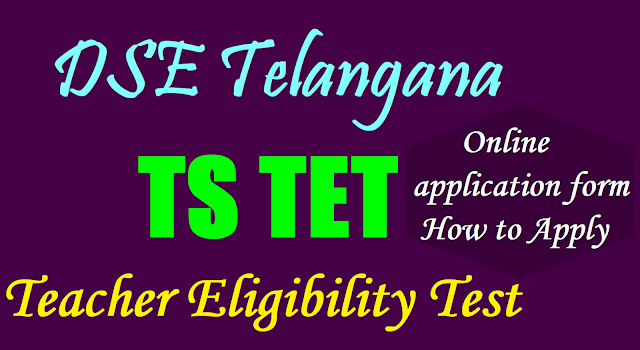 Telangana DSED will invite the Online applications from the eligible candidates who intend to be teachers to appear for 5th TET(First TSTET) 2019. So, Candidates can apply for TSTET 2019 to be held on 1st May 2019 ‘ONLINE’ only through TSTET website http://tstet.cgg.gov.in/ from.....2019. Steps to be followed in submission of application on line. The TET examination was last conducted in May, 2016. In the last one year, around 26,100 candidates have completed either B Ed or D Ed. If the government recruited teachers without conducting TET, those qualified in the last one year may approach the court. so, the state is conducting the TET now. Those who qualified in the TET earlier could also take the examination for improvement of their rank, he added. The government has decided to hold Teacher Eligibility Test in July for the benefit of those who recently passed B Ed and D Ed to make them eligible to take part in the recruitment to teacher posts in government schools. Announcing this here on Wednesday Deputy Chief Minister and Minister for Education Kadiam Srihari said recruitment of teachers to fill the vacancies in the government schools would be taken up soon after the TET results are announced in August. The guidelines of NCTE for recruiting teachers in government schools stipulate that the candidate should have passed TET to participate in the recruitment process. About 8,100 candidates have passed the D Ed and 18,000 passed B Ed this year. He said the students had requested the government to conduct TET to enable them to become eligible to apply for teacher posts. The Telangana State Public Service Commission would take up recruitment for 8,792 teacher posts in August, this year. The notification for the TET would be issued on June 10, test would be conducted on July 23 and the results would be announced on August 5. The teachers recruitment notification would be issued a week after the announcement of results. The candidates who have already qualified in TET can also appear in this TET exam to improve their score. Payment of fees can be made at TS Online or payment gateway from June 12 to 29. The TSTET Information Bulletin can be downloaded from June 12 onwards while the online submission of applications can be done from June 13 to June 30. Hall tickets can downloaded from July 17. The timing for Paper-1 is from 9.30 am to 12.00 noon and for Paper-II it will be from 2.30 pm to 5.00 pm. Payment end date extended to 24-June-2019 and Application end date extended to 28-June-2019. TS TET 2019 applications are open at tstet.cgg.gov.in and apply before June 30: TSTET 2019 Application Process Begins and apply at tstet.cgg.gov.in: The Department of School Education, Hyderabad has started the application process for Telangana Teachers Eligibility Test (TS TET) 2019. Candidates who are interested in appearing for the exam can apply for the same on the official website. TS TET 2019 will be conducted in June in eight languages including Telugu, Bengali, Gujarati, Hindi, Kannada, Marathi, Tamil and Urdu. The paper will be held in two parts and the syllabus for each medium is available on the site. The TET exam will be conducted for recruitment of teachers for classes 1 to 8 and the exam will be conducted on July 23, 2019 in all 31 districts of Telangana. The exam will comprise of 2 papers in which paper I is conducted for teachers for class 1 to 5 and paper 2 is conducted for teachers for class 6 to 8. TS TET 2019: TS TET exam will be conducted on July 23 this year. The hall ticket for the same would be available for download from July 17. Both paper I and II will be of 2 and half hours duration and will carry 150 marks. General candidates would need 60% and above marks to pass in TET. BC candidates would need 50% and above marks to qualify TET and SC, ST, and PH candidates would need 40% marks to qualify TET. Candidates applying for the TS TET 2019 will have to first make application fee payment through the link provided on the official website (http://tstet.cgg.gov.in/). Candidates would be able to fill application form only after successful submission of application fee. Candidates do not need to send hard copy of confirmation page to TS TET unit but should retain a copy with themselves. Step 1: Go to the official website of TS TET (tstet.cgg.gov.in). Step 3: Read the instructions provided carefully. Step 5: Upload the required documents. The Candidate after satisfying himself/ herself about the eligibility criteria for TSTET 2019 shall pay a sum of Rs. 200.00 for paper I or Paper II or for both through TS Online or payment gateway between .........2019 to ...2019 towards submission of application online and for the conduct of examination. At the TSonline or payment Gateway(How to pay Fee through Payment Form?) the candidate has to give the requisite data such as Name of the candidate, Date of Birth, Gender, whether the candidate belongs to Telangana State and Mobile Number. Candidate should enter his/her particulars i.e. Name, Father Name, Mother Name & Date of Birth as per his/her Secondary Education Board Class X Certificate. On receipt of fee at TSonline/Payment Gateway, the candidate will be issued a “Journal Number” with which he / she can proceed with submission of Application online. 2. Previous TET details hall Ticket Number and appeared exam month and year. e) Enter your Journal Number issued by TSonline or payment gateway, the date of payment of fee and Date of Birth. i) Then application will be opened. k) Confirm the photograph and that it is as per the given specifications. l) Fill in the application form as per the instructions given in the Information Bulletin and those offered while filling the Online Application Form. display the details submitted by you. DECLARATION 1 - I have read the Information Bulletin . * -- Mandatory Fields. * -- Either Mother's Name or Father's Name at S.No. 3 & 4 is compulsory. DECLARATION-2 : I hereby declare that all information furnished by me in this application is true and correct I undertake to produce the original documents at any moment, failing which my candidature may be cancelled. I am fully aware that furnishing false information will lead to a criminal case against me, apart from cancelling my candidature as it amounts to cheating. I am alone responsible. if any wrong entries are made by me in the application form. I accept the above declaration. vii. On completion of submission, the candidates shall take a printout of the application and store it for future use. Candidates should not post the printout of the application to TSTET office. "Payment end date extended to 29-June-2019 and Application end date extended to 29-June-2019"
Information Bulletin 5.2 (v): "B.E/B.Tech Graduates admitted into B.Ed for the 2015-2019 batch and who are now in the 4th semester of the 2nd year of B.Ed, 2015-2019 batch"
3. The candidates can also submit their complaints pertaining to their application only online at http://tstet.cgg.gov.in between (above said dates). In any case applications will not be received in any kind of manual form.